The college says all of the sensitive information has been recovered. PHOTOCOPIES OF SENSITIVE information belonging to students were left in a skip bag outside a Dublin college. The bag was left outside the Dublin College for Advanced Studies (DCAS), a private college on Dublin’s Capel Street. 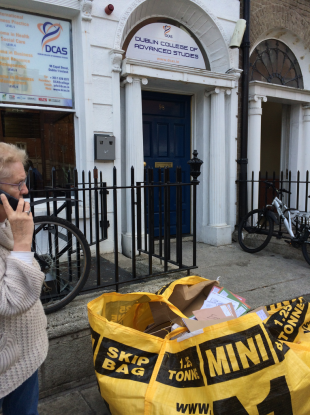 Speaking to TheJournal.ie this evening, John Ryan, the director of studies at DCAS said that the files had been left in the skip bag inadvertently in the course of a clear-out. He says that he was alerted to the situation at around 4pm, but could not say how long the files had been out in the open. Ryan says that sensitive information is normally shredded and all of the files have since been retrieved. He said he received a call from the Data Protection Commissioner’s office and had recovered the files. He added that the files contained photocopies of passports, but no bank details. Nothing was stolen, but only after gardaí intervened when a woman took files and begun shouting what Ryan felt were “inflammatory comments on nationality”. DCAS was established in 2007 and offers courses in business, IT and the English language. Email “Photocopies of college students’ passports left in a skip on busy street”. Feedback on “Photocopies of college students’ passports left in a skip on busy street”. But education and individual agency cannot help people to ‘do the right thing’ when it comes to their health, writes Maebh Ní Fhallúin. You might not expect women to be subjected to inappropriate sexual comments while working as pharmacists in Ireland, but it happens fairly often, writes Laura Farrell.